Happy New Year! I can’t believe we said goodbye to 2015 and hello to 2016 already! The past year went by so fast but I am looking forward to a new year full of yarn, patterns, hooks, and needles. I have a quick and easy pattern to share with you today. It’s been chilly around here lately, and with this cold weather I find myself stopping at Starbucks on the way home from work more than ever :). The coffee trips inspired me to make these fun and soft cup cozies! 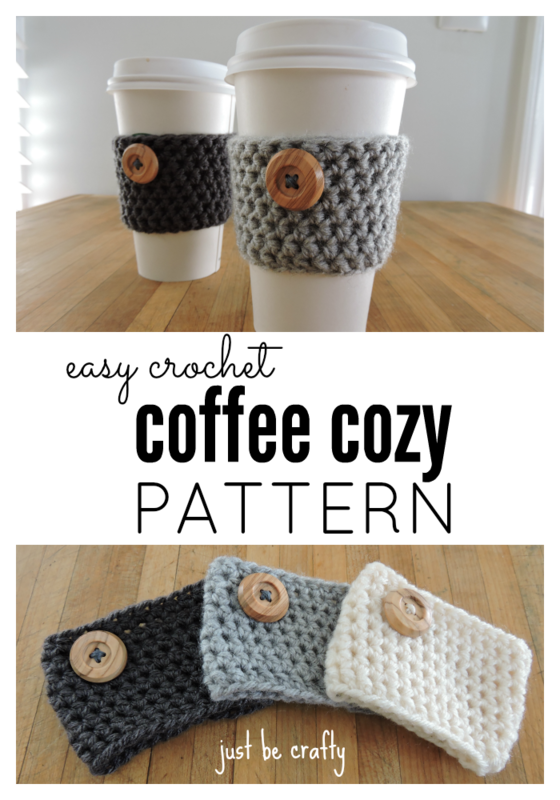 See below for the Coffee Cozy Pattern video tutorial! Round 1: ch 2, starting in same stitch as the ch2, hdc; hdc in each chain to the end of round, do not join rounds. Place stitch marker in last stitch of round. The piece will be worked continuously in a spiral. Rounds 2 – 8: hdc until end of round. Replace marker in the last stitch of each round. Cut yarn, weave in ends. Using the photos as a guide, attach a wooden button with embroidery floss. Enjoy your new soft cozy! « Crochet Fish Cat Toy Pattern With Catnip! Just curious what your stance is on people selling items made from your patterns? I always check with pattern makers for future reference. Items from my patterns may be sold but I ask that if selling online that credit be given back to me with a link to my blog. Thanks for asking! Do you have a video on how to do this? I’m not sure how to cross stitch a circle, I’ve only done washcloths and scarfs so far. I’m adding on to what you said I have just started today and I don’t know how to make a slip stitch. Very cute! But for some reason mine turned out pretty crooked… Wondering if maybe I did the spiraling part wrong? I don’t understand the “spiraling” instructions, seems like some details are left out. Why not join each round and start a new row each time instead? Nope! No instructions are left out. I designed it to be worked continuously in half double crochets without joining because I wanted the cozy to be seamless. When you join rounds it can create a bit of a visual seam. If you prefer to join each round and start a new row, that will work too! Hi. It appears thst your cozy doesn’t have a visible “Bump” on the top and bottom which I always get while working in a spiral. Any tips on how to reduce the size of bump? Hi Carolyn! A little trick for making the top look a little more even is to do a couple of slip stitches after you complete the last stitch of your last round. That should help to smooth out your uneven edge. When you don’t join your rounds and crochet in a spiral, the top does tend to be a bit uneven, but once you put the cozy on your cup it really isn’t noticeable. I am very new to learning how to crochet. Your video tutorial was wonderful and easy to follow. Thank you so much! Hi Brittney. 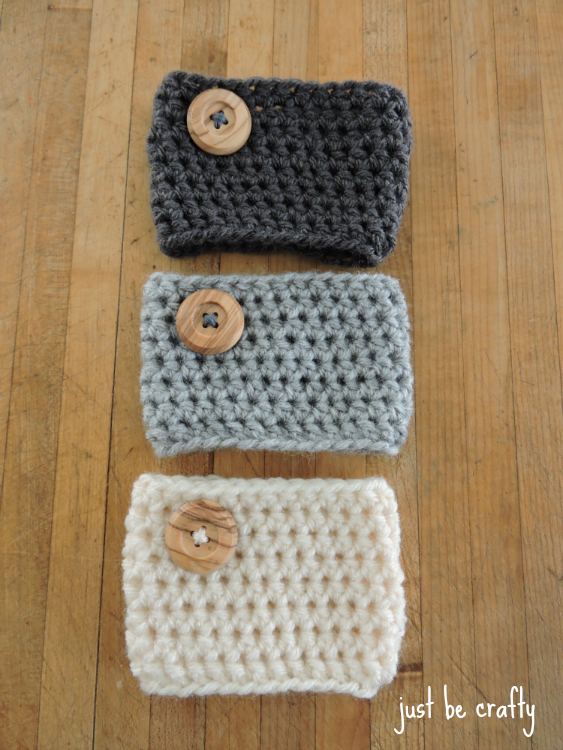 Would the coffee cozy pattern work using cotton yarn? Love your blog and patterns. Love this little project & thanks for the video. I finished this in a evening and will be giving it to a friend. It turned out perfect… thank for the free info. Totally amazing. Is it best to make a cozy with worsened yarn or cotton? You could really make a cozy with any kind of yarn you prefer! Just note, that if the yarn you pick differs from that in the pattern, your sizing might be off so you might want to keep that in mind. Hi! I love the look of this pattern, very pretty! I also love the buttons you used. I haven’t been able to find any like that. Are you able to advise where you purchased them? Quick question… when you join the ends and start the hdc, are you going into the back of the chain? Hi Julia! At the end of each round, you will join with the 1st hdc of the round and not the chain. You’ll begin the round by chaining, and will put your 1st hdc in the same stitch as the join. Let me know if you have any other questions! Thanks so much! I’ve made two so far! Awesome, that’s great! I bet they are adorable! I’d love to see them! If you’re on Instagram tag your pics with the hashtag #justbecrafty so I can see your lovely work! Do you chain 2 before you start each hdc row or just continue hdc around? Hi, love the pattern. Just a question, why do you need a stitch marker? Can’t yoy just go around and around until you’ve reached the desired height? Hi Jess! You definitely don’t need to have a stitch marker, but it just helps you keep your place in your crochet. Hi Mikaela! It sounds like you may be unintentionally increasing your stitches each round? In the post I have a video tutorial showing how to make this from start to finish – let me know if that helps! Hello! Love this pattern but I’m wondering if there is a multiple for the beginning chain so I can make it smaller. I have 1 mug in mind that this length with be too long on. Thank you! Hi sorry if I’ve missed you saying this, but what weight is your yarn? I can’t find the yarn you used to look. Thanks! Hi Randy! This yarn is 100% acrylic worsted weight yarn (4 weight). Where do you get your cups at? Where did you get your cups and what size are they? Hi Paula! These were grande cups from Starbucks!